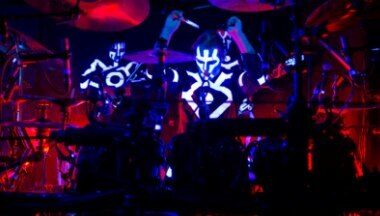 There are dozens of band members who perform in Blue Man Group shows across the globe. 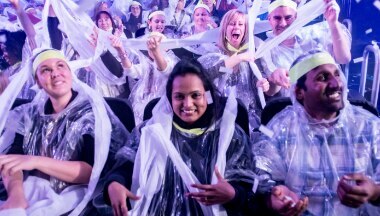 Our musicians come from all different backgrounds and many of them also perform with bands and groups outside of Blue Man Group. When auditioning for the band, you can expect a casual and friendly environment (no suits and ties – lots of jeans and t-shirts) but the expectations will be high. We are looking for great timekeeping, excellent ears/listening, proficiency on your instrument, sensitivity to tone and dynamics, and the ability to play well with other musicians. Additionally, we’re looking for enthusiasm and an open mind. We’re not necessarily interested in how many notes you can play or how fast. We’re more interested in how you use your skills to make music. If you play with drive, authority, and a sense of musicality that brings both the listener and your fellow players to a higher level, then we welcome you to audition. Drummers will be auditioned on drums we provide. Please do not bring your own cymbals, or drums. At the beginning of the audition our music directors will perform a short piece from the show. You will then be asked to play that same piece with the music directors, emulating our style and approach. It is also possible that we will show you a number of shorter parts either on drum kit or our custom percussion rig and ask you to play those as well. No chart reading or performance of prepared pieces will be required. String players will be auditioned on instruments we provide. Please don’t bring your own guitar or bass. At the beginning of the audition our music directors will perform a short piece from the show. You will then be asked to play that same piece with the music directors, emulating our style and approach. Guitarists will be asked to play guitar, and bassists will be asked to play bass. Bassists should be prepared to play with a pick. It is also possible that we will ask you to play some other parts from the show on one or both of our custom string instruments (zither and Chapman stick). If so, we will show you those parts at the audition, and the instruments will be provided. No chart reading or performance of prepared pieces will be required. Josh is the Blue Man Music Trainer for Blue Man Productions. He is also the Resident Music Director and Kit player in New York. He has been a member of the band in both London and on The Complex Tour. I believe drumming and rhythm is innate to all people. 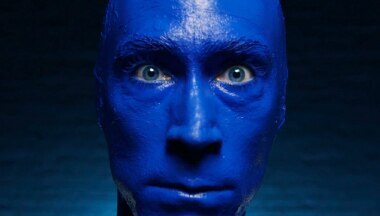 As a Blueman you have an opportunity to tap into this primal, visceral, intuitive nature inherent in your life. Rhythm! Through his drumming the Blue Man taps into an ancient mode of communication. One that we can all relate to and understand. It’s a thriving pulse that undulates throughout the performance and hopefully resonates with both performer and audience creating a profound connection. The audition process for the Blue Man band is as unique as the Blue Man character itself. There really is no way to prepare for it other than to show up, be yourself and be open to thinking outside of the box. Being greeted with a smile and an encouraging vibe as opposed to a “show us what you’ve got” attitude is what stands out most when I think back on the day I auditioned. 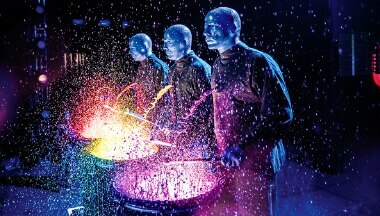 Blue Man Group is a vibrant community made up of extremely talented individuals, rich in art and music. The connections we make as individuals within the community translates into lasting memories for the audiences we perform for. Jeff is an Associate Music Director for Blue Man Productions and the Resident Music Director and Kit player for the Chicago production. He has also been a member of the Boston band. I take the casting process very seriously. It can be a vulnerable process for the auditionee. I keep that in mind each time I audition someone and try to make them as comfortable as possible. I’m looking for a musician who has a keen sense of awareness and who can assimilate a wide breadth of input into their playing. Being part of The Blue Man Group has been the most rewarding and wonderfully challenging experience of my life as a musician. It has allowed me to see the world, collaborate with extremely talented people, and grow as both an individual musician and band member. As someone who had primarily played in rock bands, I went in to the audition with an open mind and just enjoyed the experience of playing new songs on exotic instruments. I am constantly amazed by how fun the show is and feel lucky to be a strings player with The Blue Man Group. When I auditioned to be a strings player for the Blue Man Group band I knew I was walking into a very different situation then what I was used to. Unlike most auditions, it was a super fun process and I felt like my personality and musicianship were being taken very seriously.